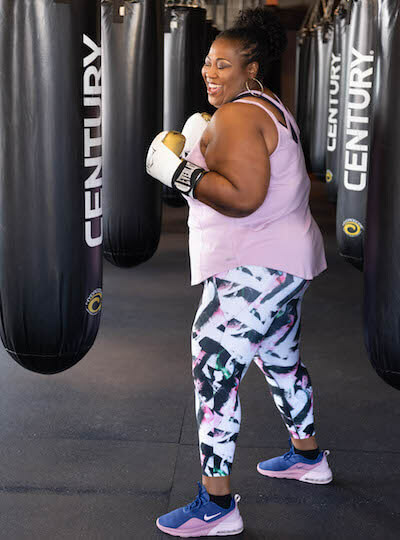 Dia&Co customer Terri Smith is a teacher, caregiver, blogger, singer, and now—she’s officially a swimsuit wearer. 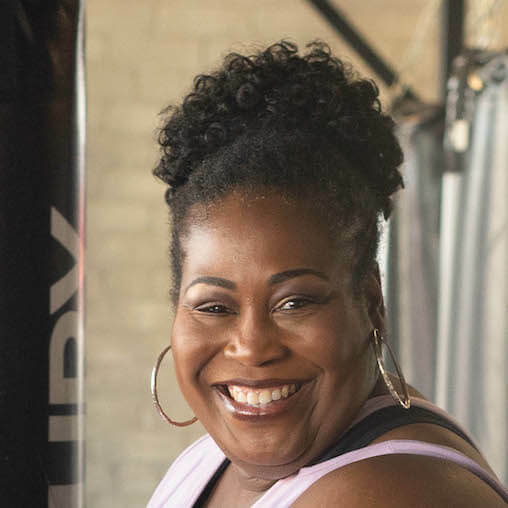 Terri explains how her wellness journey led her to feel her most confident. All of us at Dia&Co are often inspired by our community of customers—and Dia Domino Terri Smith is no exception. 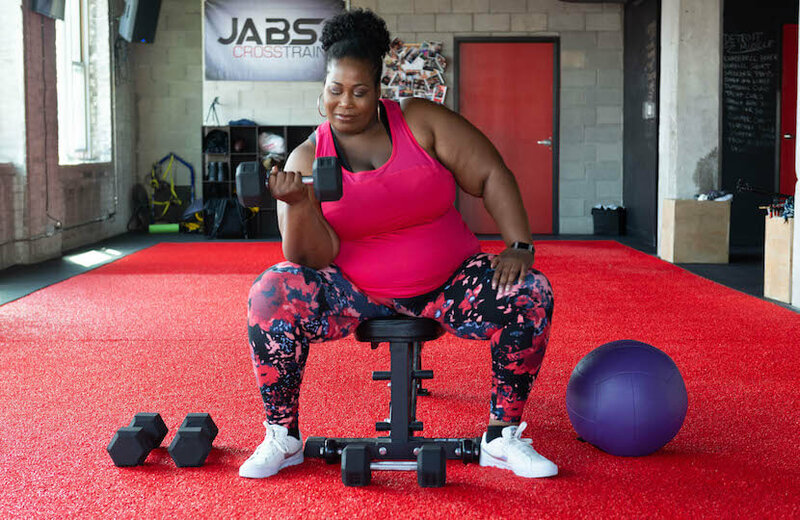 When we noticed the numerous social photos she posts of herself doing squats in various settings (including her classroom and a recent cruise), we knew we had to hear her story. I’m always on the go, fully adulting with a boatload of responsibilities. I’m a first-grade teacher in the Detroit Public Schools Community District, spending a lot of time in the classroom with my students. I’m also a Grammy-nominated singer and songwriter under the name Diviniti, so I’m often in the studio or traveling to perform. About 4 years ago, I founded a nonprofit organization. I’m a blogger, always looking to carve out time for writing, reading, and researching. Additionally, I take care of my mother which requires me to spend a sizable amount of time at home looking after her. I don’t have so much free time, but I thought I had learned to juggle my responsibilities effectively, without overlooking anything. As it turns out, I found that I had overlooked something extremely important along the way: myself. In January of 2018, I found myself at my highest weight ever and heard my doctor say to me that I’m pre-diabetic. My blood pressure was sky high and I was dealing with constant aches and pains. Not to mention my depression was back in full force! This wasn’t my first head-on collision with my blood pressure, aches and pains, or depression. In the past, I had wanted to make some changes but this time, I was fully committed. Something clicked inside of me. I knew that if I wanted to be able to enjoy the rest of my life, I had to make a change immediately. I was determined and dedicated to get healthy. Mentally, that meant I had to start saying no to some relationships that didn’t benefit me. So I moved the relationships that felt forced to the back burner. Although indulging in comfort food felt good at the time, I recognized the long-term effects weren’t good for my body. 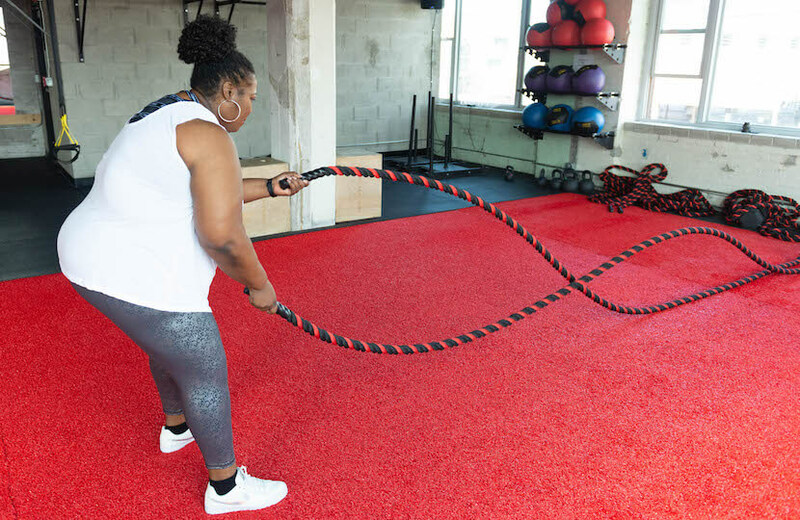 While I had been working out with my personal trainer and going to Zumba classes, I realized that I hadn’t been doing so consistently or supporting my workouts with the right kind of nutrition. I realized that I already had everything I needed in place to get healthy and be successful. Shifting into putting myself first wasn’t easy for me. I had to reteach myself how to look at life from a new perspective, to make sure I was doing what was best for me. My lifestyle change was an adjustment to the people I love as well. Mom and I started incorporating more fresh fruits and veggies into our diets. Creating a consistent exercise regimen was a challenge as I had never been one of those people who enjoyed going to the gym. 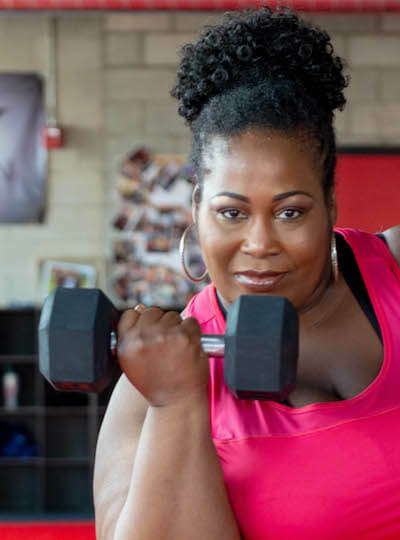 I had been known to say, “Once I lose some weight, I’ll feel more comfortable and I’ll go to the gym.” Yes, it was a backward perspective, but it was true! I finally decided that I had to be my own cheerleader. The years I spent journaling, repeating affirmations, and reading self-help books needed to be put into action. I found some things to love about myself, offsetting the flaws that I saw. I set some clear goals and got moving. While Zumba class had never intimidated me, I grew concerned about the ever-intensifying workouts with my trainer. She asked me to do a set of jumping jacks, which have never been easy for me. But I realized much of my hesitation stemmed from the insecurity I had working out in a regular bra instead of a sports bra. It made jumping jacks downright hazardous to my health! But, getting the support I need from the sports bras in my Dia&Co Active Boxes gave me the confidence boost I needed to get it done. Besides the support of family and close friends, my virtual communities were there to keep me motivated and hold me accountable throughout my journey. Sharing accomplishments and wins in both the Dia&Co National Facebook Community and the Dia&Co Wellness Community helped, as did posting workout videos on my Instagram and blogging about my wellness journey. Chronicling my journey helped keep me on track and moving in the right direction. At the end of January 2019, I challenged myself to complete 30 minutes of exercise every single day for the entire month. Not only did I continue the streak every day into February, but also well into March. Accomplishing this goal did wonders for my self-esteem and marked an important milestone—it helped me realize that I really could achieve the goals I set for myself—that there is nothing wrong with setting high expectations. I can do it! I finally decided that I had to be my own cheerleader. After experiencing several peaks and a few valleys on this journey, I have seen some true change. I’ve lost pounds and inches, but most importantly, my blood pressure is within normal range, I’m no longer pre-diabetic, the aches and pains have dissipated, and my depression is under control. I’m still teaching, singing, blogging, non-profiting, and taking care of my mother, but now, I’ve also made a point of taking care of me. Exercise and wellness have moved to the top of my personal priority list. I’m still doing personal training sessions and taking Zumba classes, but I’ve even developed a fondness for kickboxing! What I’ve learned from this journey is that focusing on myself and my own wellness will lead to countless positive outcomes. What I’m most excited to have found along my journey is my confidence. Though I had been going to the gym here and there and taken some Zumba classes, I didn’t feel comfortable in those active environments. 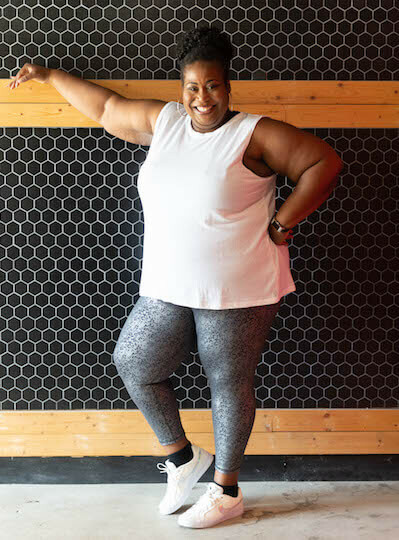 While my confidence had been on a steady incline outside of the gym thanks to the Dia Style Boxes full of cute clothing I’d been receiving and being part of the active Dia Community groups, I didn’t feel the same way about my gym uniform of an oversized T-shirt and stretch pants. That outfit didn’t exactly make me feel like I was ready to take on whatever physical challenges came my way. I noticed that my trainer and my Zumba teacher always wore something cute and sassy, and while they never made me feel bad about what I wore, I wanted to be cute and sassy in the gym too! Then, I started to receive the Dia Active Boxes filled with fashionable and functional pieces that made me excited to workout. Now, my gym style can compete with my stylish fitness instructors! And in turn, feeling more confident in my workout outfit makes me feel more comfortable with trying new things like kickboxing and posting my workouts on social media. The confidence that came from focusing on improving my health has bled into other parts of my life as well. For the first time in over a decade, I wore a swimsuit! With my newfound confidence leading the way, I packed two different swimsuits for my recent cruise and wore them both with pride. I have not worn a swimsuit in more than ten years – probably more than that. Well, after working hard in the gym and feeling better about me, I figured going on a cruise was the perfect time to get over it and get into the water. And that’s just what I did! If you’re waiting for some external event to spur you on towards living the life you are meant to live, stop waiting. Find something you love about yourself right this moment and celebrate it. Then, find something else and celebrate that too. Grow your list of things you love and celebrate about yourself. Affirm yourself. Give yourself daily pep talks. Write yourself a love letter. Go for a walk and fill your ears with the music you love. That’s how it starts—with self-loving baby steps. As you feel better and stronger, do more and keep going. Find something you love about yourself right this moment and celebrate it. Then, find something else and celebrate that too. Love yourself to life! That’s where I am right now. By no means is my life perfect, I don’t love everything about my body right now. I still shed tears, get discouraged, and feel stuck. But the difference is that I no longer stay stuck. The list of things I love about myself is much longer than the things I am learning to love. I feel strong and comfortable in my skin. I’m walking with my head held high and my shoulders back. I’m grateful for the teaching, singing, blogging, caretaking, non-profiting, and all the other things I do. I’m grateful for choosing to put myself at the top of my priority list and I’m grateful for Dia&Co for giving me the chance to do it all with style and grace. is a Dia Domino, teacher, singer, blogger, and all-around style icon. Want to learn more about the amazing women in the Dia Community? Keep an eye on the “Meet” category!